With just 37 days until the release of Star Wars: Episode VII The Force Awakens, there is no denying Star Wars is back in he public eye like never before. 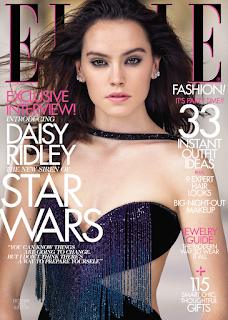 The latest magazine to feature a star of the new film is Elle Magazine, which features a cover story on Rey actress Daisy Ridley (above) in their next issue, a brief excerpt of which can be found on their website. "We were told about this scorpion in Abu Dhabi that, if it stabbed you, you needed treatment within half an hour. There was this bit where I was lying in the sand, and if a scorpion got me, the nearest hospital was an hour away. So I was like, I could die right now. I could be dead in half an hour." "[Rey is] so strong. She's cool and smart and she can look after herself. Young girls can look at her and know that they can wear trousers if they want to. That they don't have to show off their bodies." "There is no Dana... only Zul"